Bottom Line: A nice spicy, snappy syrah with juicy acidity. Syrah - also known as Shiraz, especially in Australia - is a red wine with rich, zesty plum and blackberry fruit along with a light spicy, sometimes peppery quality. The grape has light to medium tannins, meaning lighter versions are drinkable upon release. This has certainly helped this wine's popularity in the United States. Full-bodied versions, such as Côte-Rôtie from France's Rhone Valley, are intense, deeply concentrated wines that need many years to round out; these are generally at their best seven to ten years after the vintage and can drink well for 20 years plus from the best vintages. Recommended foods with Syrah include most red meats, game and barbecued foods. 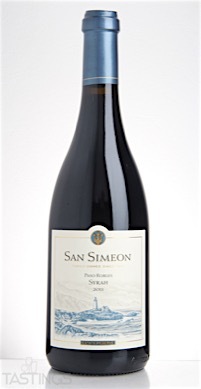 San Simeon 2011 Estate Reserve, Syrah, Paso Robles rating was calculated by tastings.com to be 92 points out of 100 on 5/31/2016. Please note that MSRP may have changed since the date of our review.